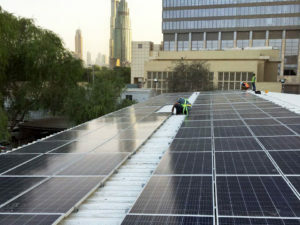 Enerwhere Nigeria, a Kano-based, distributed utility company with head offices in Dubai, recently commissioned a 73 kWp solar hybrid plant on the roof of Rumbu Industries on Hadeja road in Kano. The first of its kind, this project is breaking ground on the commercial and industrial solar market in Northern Nigeria and leading the way for a more sustainable, cost-effective solution to face the sectors power challenges. Rumbu Industries Ltd is one of the world’s largest plastic mat producers, exporting to West Africa and beyond. Based in Kano, Northern Nigeria, they have over 1,000 employees and operate up to 24/7 with average daily power needs of over 500 kW. The poor grid supply in the Kano region regularly forces Rumbu Industries Ltd to use diesel generators, with just 60% of their annual energy usage coming from the grid. Power reliability is particularly key for this industry, as their machinery quickly gets clogged during black outs. The resulting high fuel and operating costs, together with regular breakdowns of the generators and UPS systems, have been a major headache for the Rumbu Industries operations team. Enerwhere’s solar rooftop plant cuts the company’s dependency on diesel generators by reducing its fuel consumption, generator running hours, Kedco bills, and consequently overall power cost. Ibrahim Buhari, the chairman of Rumbu Industries, explains “Enerwhere were the most economical energy solution available to us and the system will pay for itself in under 4 years, after which the energy is free”. The 73 kWp solar rooftop plant is expected to produce over 100 MWh of electricity per year, which will save approximately NGN 6 million in energy costs annually. The system was fully designed, engineered and constructed by Enerwhere. This project is supported by aid from the UK government, provided through the Solar Nigeria Programme and implemented by Adam Smith International. According to Mr. Sani Saleh, Executive Director at Rumbu Industries, “Enerwhere held their promises and delivered the project end-to-end with professionalism. With their remote monitoring system, they keep track of our production and ensure maximum performance”. To further reduce its reliance on intermittent Kedco power and expensive diesel fuel, Rumbu Industries plans to further increase the solar share by adding another 300 kWp solar PV on their roof. The Chairman expresses his vision: “we are now convinced of both the reliability of the technology and Enerwhere’s capabilities, and we are looking forward to expanding the plant to maximize our savings on the long term“. ABOUT ENERWHERE Enerwhere is the world’s first distributed solar utility company, based in Dubai. Enerwhere uniquely combines a range of technologies to provide the cheapest, cleanest, and most effi- cient energy solution to meet the power needs of customers in manufacturing, construction, oil & gas, mining, and hospitality sectors. Recently launched in Nigeria, the local Enerwhere branch is focusing on delivering cost effective solar systems to industries in Northern Nigeria where solar resources are abundant while the utility and diesel supply are at their weakest. For further information about Enerwhere, please visit www.enerwhere.com.